Most of us are very particular when it comes to the shelving of our books. Alphabetical order is generally a given, as is shelving by genre, but not everyone does things the same way, with the one common thread being order of some kind. For instance, all of my books are in order but a significant number of my shelves no longer follow the alphabet. When I started this blog the books got placed according to when the bookshop they were from got written about. It's a nice reminder of my journey and also a lot easier than shuffling along the entire bookcase every week. And I'm not alone. I've met people who order books by colour, by date read or studied or simply by height. So long as there's an order of some kind my bookish OCD can cope and I'm able to resist the urge to re-shelve all their books by the alphabet. Which means I'm okay when I find myself in a bookshop that doesn't immediately appear to follow the alphabet either. 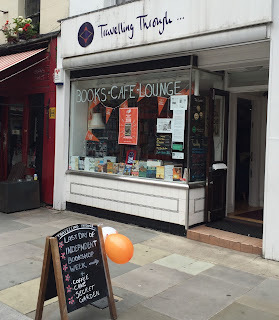 Travelling Through... on Lower Marsh near Waterloo in London is one such bookshop. 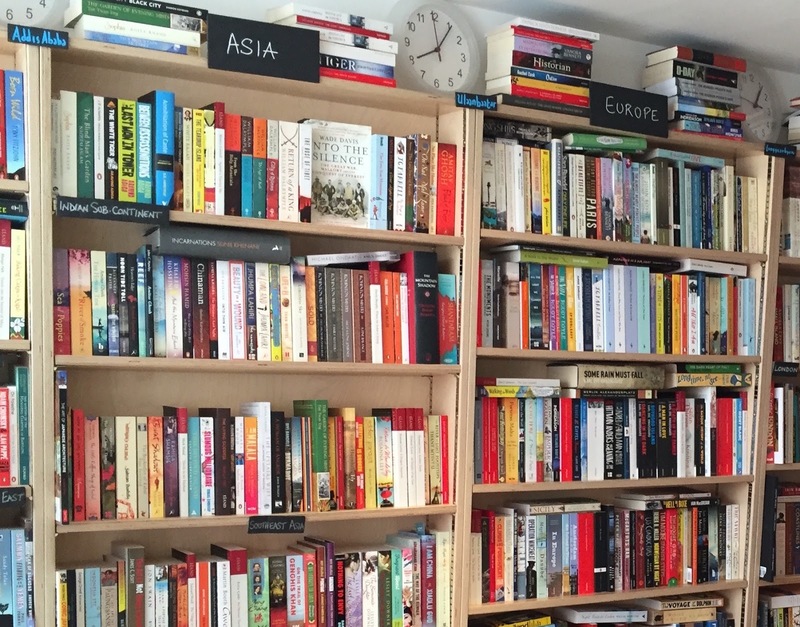 In its own words: "Whether it is fiction, non-fiction, travel writing, memoir or biography, we categorise our recommendations by continent, country and place rather than by genre. In this way, we hope to inspire cultural discovery across the world and across London." The journey to the bookshop itself is one of discovery as you leave the mainline train station to head in the opposite direction to the way most people are heading. 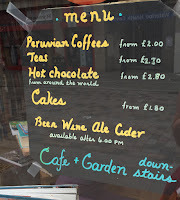 I'd not previously heard of Lower Marsh, but it's a varied and interesting street of shops and places to eat* if you're looking for an alternative London experience. My trip was as part of a bookshop crawl, so I didn't have time to fully investigate all that was on offer, but I could easily have loitered nearby (and in the bookshop) for longer. The bookshop itself appears to be a small journey of discovery, and the main room is nicely compact. 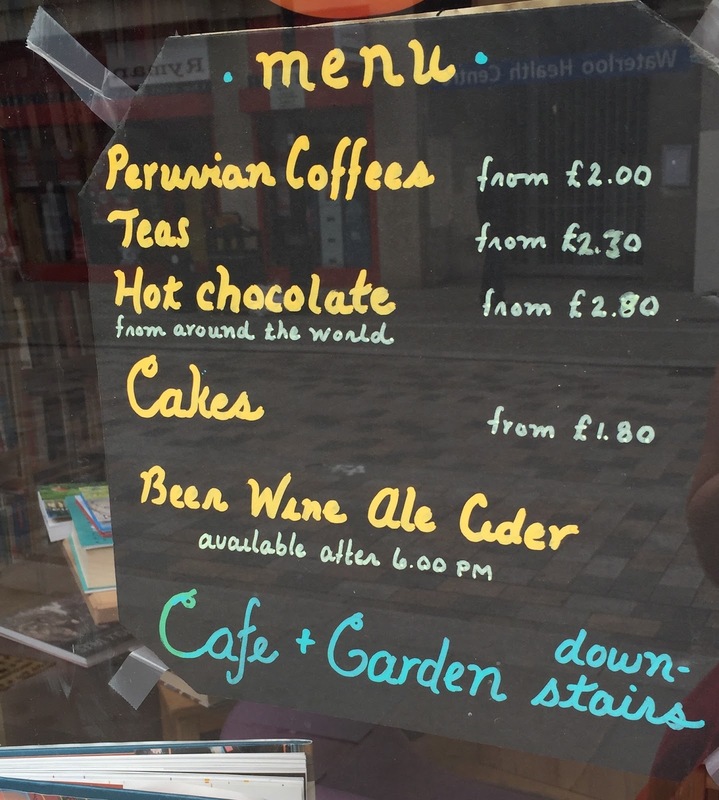 However that room is still very well-filled and leads on to other equally interesting rooms and even a large basement cafe (where secondhand books are available) which looked like the perfect opportunity to travel the world on a plate as well as a page. 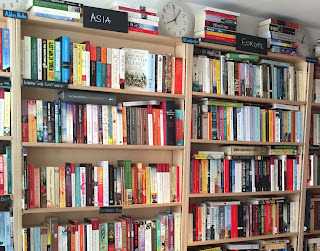 Staying in the main part of the shop, there's a bookcase for travel guides, a wall to journey around the world and a selection of recommendations, which at the time of my visit comprised books linking to an exhibition being held further along the road. It was the world wall with its continental shelving system and clocks indicating different timezones that made my visit memorable. 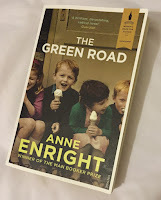 Seeing the books by country really did take me on a cultural journey, making me think beyond the alphabet and appreciate how little books care for borders or ethnic differences: a good book is a good book no matter where it originates from. It also made me think more about where my own reading choices are from and realise they're more international than I'd assumed. While browsing I expected to choose a title from some far-flung place in an attempt to broaden my horizons, but the other thing I was reminded of while visiting Travelling Through... was that you don't have to travel far to find interesting experiences. 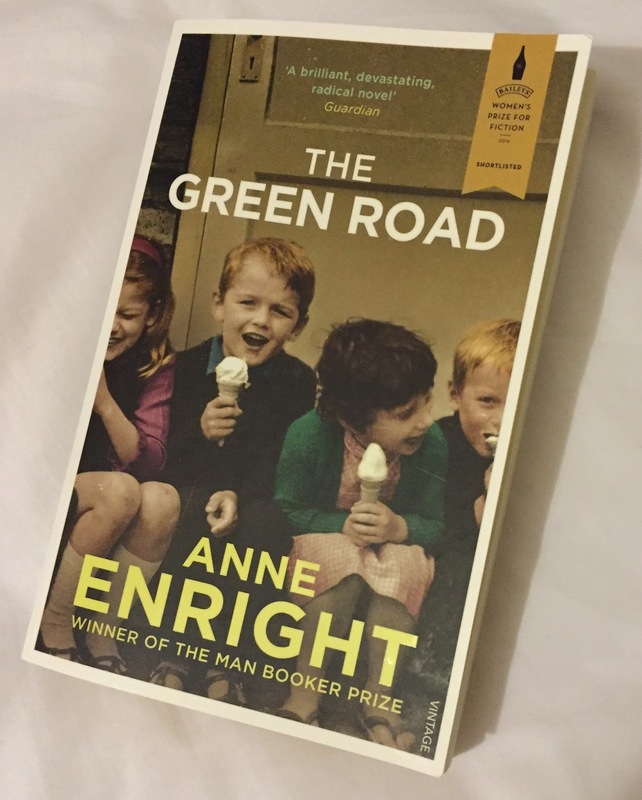 My purchase, thanks to a bookseller recommendation, came from Ireland: Anne Enright's The Green Road. Not a distant country geographically, I was surprised by how few books I knew from there and pleased to have some of them picked out for me during our conversation. 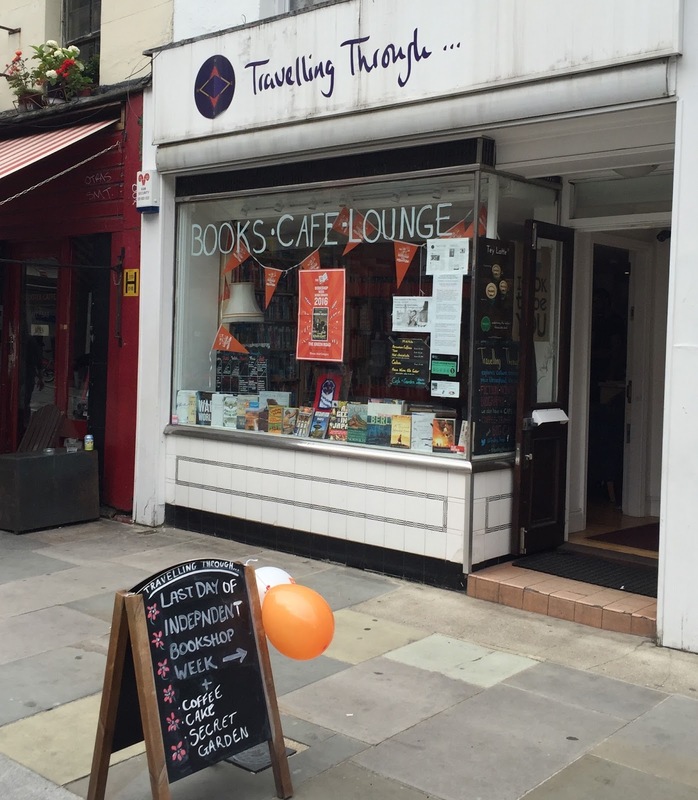 Its proximity to Waterloo railway station means Travelling Through... is a surprisingly easy bookshop to visit when you are travelling through or simply exploring the area. Best of all, thanks to those well organised shelves, it's a journey around this wonderful world. *I also recommend walking along the back of the street, where a giant model camel can be spotted on the roof of a restaurant. Obviously. The whole area is definitely worth a visit, I was pleasantly surprised by how much there was to tempt me. Thanks. Just took notes on Lower Marsh for my trip from California to UK next April. This is just the kind of thing I'm looking for. Will make it part of my walk along the South Bank. Looks like I can get the bus at Blackfriars Road, get off at County Hall and walk. I hope that is a reasonable thing to do. I'm 71, love bookshops and coffee places and London. Can't wait to get going!! Excellent! I'm pleased my adventures are helping with your adventures. My travel directions will be rubbish, so I daren't agree or disagree with your suggested route but do hope it's a success and that you have a good visit. Should you be looking for more unusual places to visit I recommend a guidebook called London for Lovers (which I've always used by myself) for highlighting fascinating places.